COME SEE OUR NEWEST EXHIBIT! Now on display a detailed replica of the White House oval office including the resolute desk. Our thanks to Mr. Tommy Candido for the loan of this exhibit. BRING A FRIEND AND A CAMERA TO THE MUSEUM! Available at the museum the book "Images of America-Groveland" by Doris Bloodsworth. Doris Bloodsworth won the Writer of the Year Award for her pictorial history of Groveland titled Images of America: Groveland. This is the only comprehensive, published history of the city. Proceeds help fund the Groveland Historical Museum. >> CLICK HERE to order. HUGE thanks to Rex Day Winn, grandson of L.Day Edge, who allowd the Groveland Historical Museum to duplicate rare photos and memorabilia from his grandfather's collection. L. Day Edge was Groveland's first mayor and the youngest Florida Speaker of the House among many achievements. 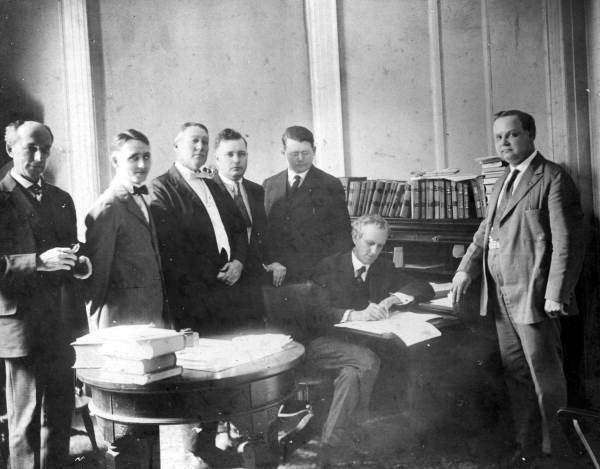 Sen. L. Day Edge (4th from left) watches then Gov. Sen. Cary Hardee sign legislation creating Union County. This photo is part of a rare collectibn of photos and memorabilia available for viewing at the Groveland Historical Museum. You're invited for a morning filled with history, music and mystery! >>CLICK to find out more. Come see our video archives listed below. Or >> CLICK HERE to order your own copies to view at home! Julian Rowe, Vera Sloan Boyett, Ray Robbins. The Giving Tree honors our donors. 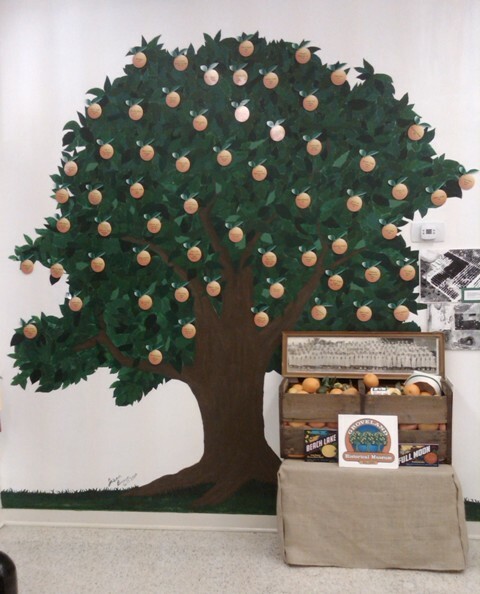 The orange tree is symbolic of Groveland's past. Museum donors have oranges with their names, or the names of their company, class or loved ones, on the tree along with each year they donated. The museum is a 501(c)(3) charity and depends solely on the contributions of ots supporters. Additional $30 = laminated donor orange. The Groveland Historical Museum is a joint project of the City of Groveland and the Groveland Historical Society, a 501(c)(3) nonprofit agency that depends upon your tax-deductible donations. The Groveland Historical Museum is operated by a partnership of the City of Groveland and the Groveland Historical Society, a 501(c)(3) nonprofit agency. Copyright © 2012 Groveland Historical Society. All rights reserved.